Stay and play with the Overnight Reef Encounter for as little or as long as you like! 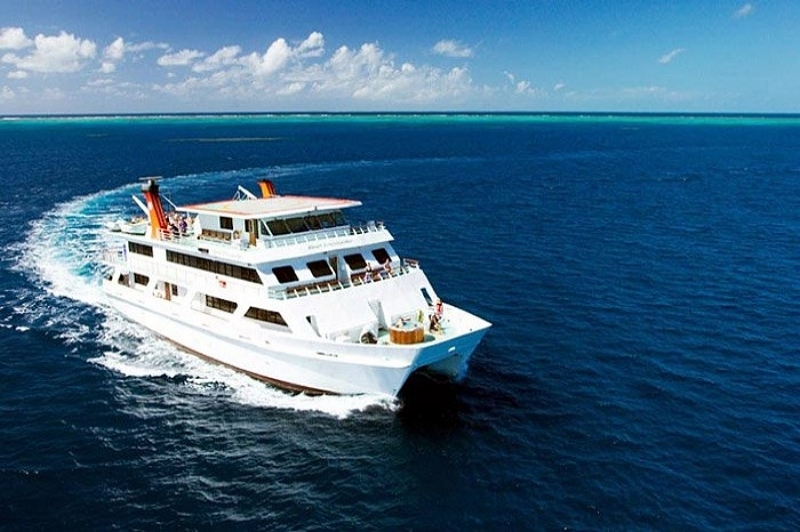 With stylish accommodation, exciting onboard features and of opportunities to snorkel and scuba dive, this is the perfect choice for someone seeking a genuine Great Barrier Reef experience. Want a true Outer Great Barrier Reef experience? Stay there for the night with Overnight Reef Encounter. This 35 metre catamaran is the ideal vessel to experience snorkelling and diving at the outer Great Barrier Reef! And, when not in the water, relax and enjoy the atmosphere onboard with air-conditioned comfort, spa, spacious decks, and dining and recreation areas. With the flexibility stay on the boat for up to 4 days, there is plenty of time to explore the reefs, and even the choice to experience the glass bottom boat with marine life commentary. 10.30am: Snorkel, sunbake and relax with lunch served at 12pm. BOOK WITH US TODAY CALL 1800 550 751! Overnight bag - If you wish to store any excess luggage we are happy to do so in our office at 100 Abbott street Cairns. As the air-conditioning is on a set temperature for the heat during the day it can become quite cool in the evenings, even just being on the Great Barrier Reef can be cooler at night-time, therefore a light long-sleeved pullover, cardigan should be taken. Proof of certification if you are a certified scuba diver. * Reef Encounter has a fully licensed bar - NO BYO! All departures and itineraries are subject to weather. Tours may be changed or cancelled for any reason at the discretion of the Tour Operator. It should be noted that adventure travel involves risk. Whilst we make every effort to safeguard clients, we cannot be responsible for personal injury or loss due to actions of our clients which are beyond our control. We recommend that all clients have travel insurance covering illness, injury, loss or damage to personal belongings and not being able to travel on the confirmed date of departure. Please be aware operators pass on credit card merchant fees so there is a non-refundable 2.5% surcharge for VISA, MASTERCARD and AMEX card purchases. All client cancellations forfeit 35% of total ticket price and all client cancellations made less than 30 days prior to departure will result in complete forfeiture of the full price of the tour or package. If the tour operator has to cancel the trip or activity (prior to the departure) and we cannot offer a suitable alternative, then a refund will be given minus card fees. We strongly recommend that you have travel insurance.